Well, if anyone is up for putting tahini in their brownies, it’s me! Most folks have only experienced tahini in the traditional sense–in a creamy hummus dip or a tangy tahini sauce atop a juicy kabob (which I highly recommend). My friends, it’s time to expand your tahini experience. Added in desserts like my earlier shortbread cookies or today’s chocolate brownies…well, it’s a game changer! While adding flavor to chocolate brownies isn’t a new thing, I’ll have to agree with Christopher Kimball, the occasional marshmallow, nut or swirl of peanut butter, doesn’t take brownies much farther. Most remain one-note wonders. Tahini and chocolate are a complex grown-up pairing; you’ll discover they are such the perfect match. But the whole point of this tahini brownies was not to simply add a different flavor to a classic brownies recipe. Tahini is a key ingredient here. Instead of adding tahini to a classic brownie batter, we stir chocolate into a tahini base. The game does change. A lot! These tahini brownies are extremely moist and rich with a nutty sesame flavor. Tahini paste is easily available at Mediterranean grocery stores. But you can also find it at specialty food stores and, sometimes, in your local grocer’s international section. You can find a variety of quality tahini online purchase here. 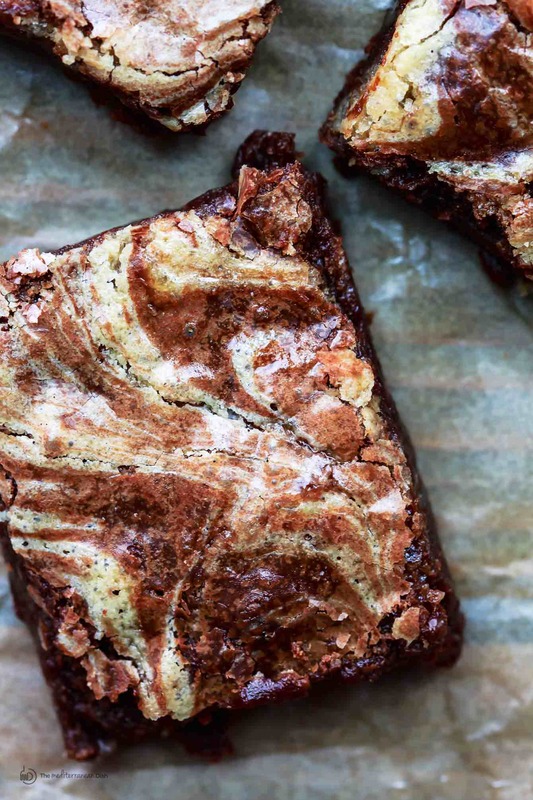 These tahini brownies are anything but your average one-note chocolate brownies. 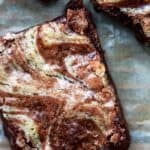 Moist chocolate brownies with a generous swirl of tahini (sesame paste), which takes the brownies to a whole new level of flavor bliss. Heat the oven to 350 degrees F. Line an 8-inch square pan with 2 pieces of foil (crossed, and with excess hanging over on all sides of the pan). Lightly brush the foil with butter. In a large mixing bowl, whisk the eggs, sugar, vanilla and salt to form a slightly thick mixture. Add the tahini and whisk to combine. Now fold in the flour, stir until just incorporated (do not over-stir). Reserve half of the tahini mixture in a separate bowl for later. Add the melted chocolate mixture to the remaining tahini mixture, stir until batter is well combined. With a spoon, dollop the reserved tahini mixture over the top (imagine a grid, and add one dollop of tahini mixture to each square on that grid). With the tip of a butter or pairing knife, swril the tahini dollops into the brownie batter. Place the pan on the middle rack of the 350 degrees F heated-oven. Bake for 28-30 minutes, until the edges are set but the center remain moist. Remove from the oven. Cool in the pan for 30 minutes. Lift the foil edges up carefully to transfer the brownies from the pan. Cool for another 30 minutes (do not remove from the foil yet). Cut into 2-inch squares. Enjoy! Recipe slightly adapted from Christopher Kimball’s Milk Street Magazine (March-April 2017 issue). You need to fully bake these brownies, they are very tender (even wet) if you don’t bake them through. Make these brownies the night before, if you like. The tahini flavor will intensify! Wow, before this I have tried several other recipes to add tahini to brownies, but they never quite worked. But these are great! Intense, fudgy chocolate, some with the subtle tahini flavor….even DH and both sons (one is a chef), who came for dinner, loved them. Sent ther rest home with them and will make more tomorrow. Thanks! Yay! I am so glad you’ve found the tahini brownie recipe for you! These are the BEST brownies I’ve ever made or even tasted. Thanks heaps for the great recipe! Sam, I am so so glad to hear it! My family loves these brownies! 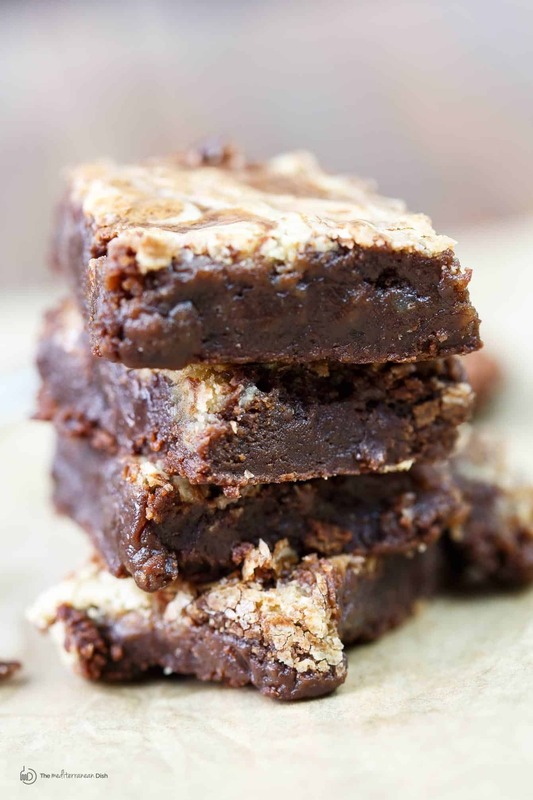 These tahini brownies look fabulous! Tahini in sweet dishes is amazing. I love tahini and honey together, one of my favorite all-time combinations. I’ll have to try this recipe! I think this is what people say ‘meant to be’ – I was just cleaning out the fridge last night and saw that I had forgotten a little tahini at the back… I was telling myself I gotta use it up this week, and look what I stumble on??? Meant to be! Totally meant to be! Hope you try it, Tina! I love tahini paired with chocolate! I need to give these a try — just wow! Isn’t it a great combo?! Enjoy! These look amazing! I love how few ingredients are required for this recipe too. I am thinking I may have to try these for an upcoming party. Thanks for sharing! Yes, you totally should! It’s a pretty simple recipe…and like you said, not a ton of ingredients. Oh my gosh, I’ve been wanting to try tahini in my banana bread and this sounds so delicious. I love mixing up flavors in new ways like this. Gorgeous photos! Oooh, I love the idea of tahini in banana bread! You’ll have to tell me more when you try it. 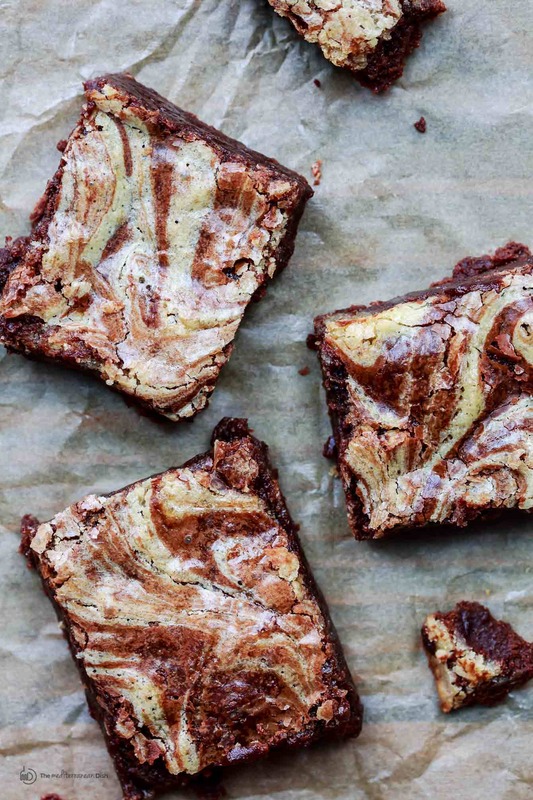 Gorgeous swirls, and I just read about tahini brownies the other day for the first time ~ what a delicious idea! It is a delicious idea! My kids favor these brownies over anything I’ve tried before. It’s a regular treat now. I just bought tahini paste this week for the first time in years, as part of my mission to cook healthier, but with no specific plans for it. So glad you posted this recipe! Oh there are so many ways to enjoy tahini! I hope you’ll give this a try. thank you for stopping in!